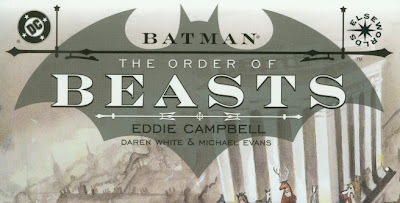 Eddie Campbell: covers- BATMAN: The Order of Beasts. covers- BATMAN: The Order of Beasts. I gave up the self-publishing at the beginning of 2003 and spent the following year painting a 48 page Batman book. The cover was the last part to be done. I made a couple of sketches. My editor said no to the first (2), probably because the arrangement of characters in the foreground gave away too much about where the plot was headed. The picture on the right (3) is a scan of the finished cover without the logo (1). Daren White co-wrote and Mick Evans did all the production work including the lettering using a font designed by Woodrow Phoenix (Mick also came up with the title; he's always good at that sort of thing). I was pleased with the way it worked out and with the fact that we packaged the whole book ourselves leaving space for DC to add a logo and drop in the indicia and credits. I'm still not sure howcome they allowed me to do all of this. I'd never even done a whole issue of anything for DC before, never mind a 'prestige format' book with a shiny card cover. Here's the story behind it, since I have gotten into the swing of laying out the business complexities over the last few posts, though that wasn't my original intention when I thought of showing some old cover sketches beside their related finished versions. I was already working on this when I drew a line under Eddie Campbell Comics at the beginning of 2003. It started with either my short Batman piece in Bizarro that Hunt Emerson illustrated, or my interview in Egomania #1 with old time Batman ghost artist Lew Sayre Schwartz (who has remained a very dear friend over the last five years), or perhaps both. I had let the world know that I was something of an enthusiast for the old Batman stories, particularly late '40s early '50s (Schwartz, Sprang etc. -Here's an article I wrote on the subject way back in 2001. I just reread it and I still like it.) 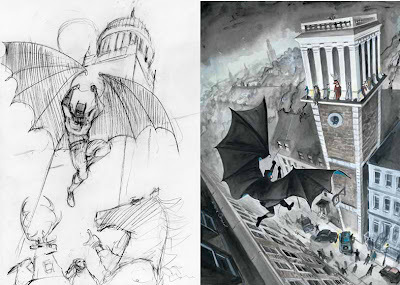 I was invited to pitch a script idea for a proposed Batman to be drawn by Tony Millionaire. I wasn't interested in that and I don't know if it ever came about with another writer, but when I mentioned the whole thing to my pal White, he said he had been sitting on his own Batman idea for some time, and how dare I turn down the gig without asking him first. I mixed this up with half an idea of my own and pitched it to Joey Cavalieri at DC. Somehow we got in. Then I made things complicated. I said that nothing would make me happier than to draw this myself. They said they didn't allow a situation where a creator would both write and draw the same book unless he was 'incorporated'. I mentioned this to Whitey, whom you may remember is a chartered accountant, so that's exactly his field. He said, "It's not as complicated as you think. A company's just a box of documents you can keep under your bed." And it doesn't cost too much either, well compared to the amounts I've been bandying about here of late. Now, companies are usually named and indexed by having two unassociated words hinged together (well, this is the campbellian explanation), so he finds a combination that he figures will embarrass me, runs the checks to confirm it's not already in use, and next thing you know I'm director of a company named 'Antelope Pineapple Pty. Ltd', just so I can get to draw Batman. Then I asked if I could paint it too. For a week it looked like this wasn't going to fly until I explained that all I meant by that was that they take the amounts they were going to parcel out to penciller, inker and colorist and give them all to me instead. Somehow or other I got what i wanted and It all worked out well. That was my first full colour book, and I've been working in colour on all my books since then. It was the beginning of a new phase in my career, leaving the self publishing one far behind. However, that damn Antelope Pineapple Pty. Ltd lately became a millstone around my neck. I have a hard enough time remembering one set of tax dates and duties without being legally obliged to remember another and different lot. More than once I have been fined for missing a superannuation deadline or some other important pecuniary obligation. I decided to get rid of the thing. So three months ago I went to see my regular accountant, and it cost me more to get out than it did to get in, what with things being in a muddle. But while on the way I passed a tea room and I pulled over on my bike. I was reminded of my Bruce Wayne having a cup of English tea at the beginning of The Order of Beasts. Outside they had a blackboard with an interesting quote chalked on it. which has stuck in my noodle: "Reputation is character minus what you've been caught doing" (by someone named Michael Lapoce). Anyway, the previous tax year had been bad for me, what with From Hell being out of print all that year, but me still paying large in taxes, and I got a huge rebate of $15,000 bucks. My accountant's young assistant accountant was handling it all for me. In a moment of bravado I told him why I had the damn company in the first place, and how it got its daft name, and Whitey's assistance in the matter, all just so I could draw a Batman comic book, and I think he thought it was very cool and interesting. And as we were finalising the paperwork I said, "Now do I have to hand over that box of papers from under my bed?" He looked at me for a minute as though to probe my noodle and find out if I was joking. And then he said, "uh, no, you can keep that." I feel that being the post-er of a 'first comment' for one of Eddie's blogs would be a role much better filled by a myriad of other blog-lurkers than myself; it deserves better. However, I have found myself at the right place (a cold study) at the right time (shortly before midnight) and so will besmirch this page with my own comment. I really only wanted to praise the name "Antelope Pineapple Pty. Ltd", but now that feels inadequate. So here we shall pretend that instead I have said something marvellously intellectual, revolutionary if you will, or at least fascinating, and then we'll go on our way. Do forgive an insomniac adolescent who doesn't know when to shut up. Ignore me. "Somehow we got in." Such modesty. I was away from comics for so long that I had no idea you'd done supherhero stuff. I'll try to find it--and the damned Capt. America thing you did. What's the Pty.? Is that short for party or is it a legal Aussie term like plc? The insight into DC business practises is nice, makes me wonder if Frank Miller has legal documents under his bed for Spartan Ronin Ltd. or something. That Batman book was rollicking good fun, that cup of tea bit was what I had in mind when I was saying how much I liked the way you did the setting. Don't want to say anymore in case I spoil it for hemlockman. 1) Become an employee for the duration of the comic book. 2) Credit your wife as writer. My dictionary says that Pty. stands for proprietary. Or "property," according to some Commonwealth counsels I've spoken to. I don't know why DC would limit the writer/artist role to creators with personal corporate entities. I'd like to hear an explanation, actually, to satisfy my curiosity. The Pty is short for Propriety. It means its a private company rather than public. Nice sketch. I hadn't seen that before. you did mean 'proprietary', didn't ya? I always have to double-check Whitey's spelling. A couple of real clnkers have made it into print over the years of our association. that would be 'clinkers', I presume. it occurs to me now that the emblematic thing he's doing with his cape would be duplicated in the logo, which is pehaps why it didn't work. Don't know if it's of interest to you or not, but The Blue has just had an entry on Kirby's work on the 2001 comic.